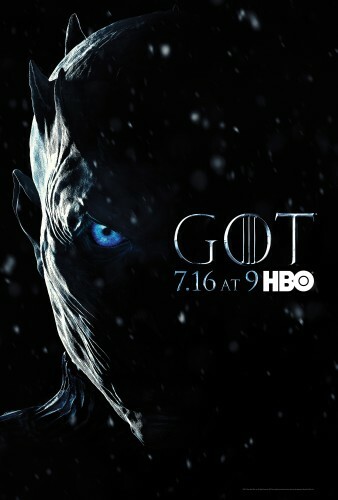 The EmmyÂ®- and Golden Globe-winning GAME OF THRONES returns for its seven-episode seventh season SUNDAY, JULY 16 (9:00-10:00 p.m. ET/PT), exclusively on HBO, followed by other episodes subsequent Sundays at the same time. Based on the bestselling fantasy book series by George R.R. Martin, the hit fantasy series chronicles an epic struggle for power in a vast and violent kingdom. Returning series regulars on GAME OF THRONES this season include: EmmyÂ® and Golden Globe winner Peter Dinklage (Tyrion Lannister), Nikolaj Coster-Waldau (Jaime Lannister), Lena Headey (Cersei Lannister), Emilia Clarke (Daenerys Targaryen), Aidan Gillen (Petyr “Littlefinger” Baelish), Kit Harington (Jon Snow), Diana Rigg (Lady Olenna Tyrell), Sophie Turner (Sansa Stark) and Maisie Williams (Arya Stark).